SummerHouse #3 is a secluded seaside vacation townhome, directly across from the sugary-white beaches and sparkling emerald waters of the Gulf of Mexico. Three rows of delightful spacious townhouses surround a private swimming pool and a sundeck, while open, beautiful landscapes wind through the Caribbean-style grounds. It is without question the perfect vacation spot! Our two level two bedrooms two and a half baths townhouse has completly been remodeled with new kitchen and bathroom cabinets, furniture and appliances. Nicely decorated, this townhouse features a peaceful roomy master bedroom with a 32' flat TV, a second bedroom with bunk bed and queen size bed, and a living room with queen sleeper sofa and a 42' flat TV. Guests may also prepare their own meals in the fully equipped kitchen or enjoy a gas barbecue outside on the patio. Located at the most sought-after Destin area, our townhouse is steps away from a stimulating day at Miramar Beach, where you can bathe under the wam sun, soak in the cool gulf waters, or simply saunter in the softest stretch of fine white sand. 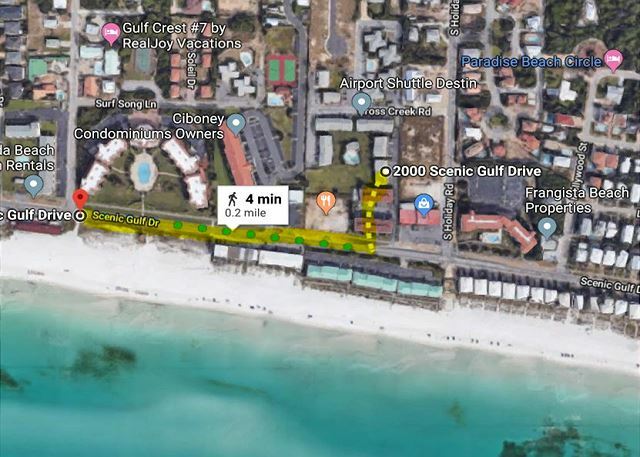 You can also watch for dolphins, rent a bike, jet ski, walk to Pompano Joe's for fun drinks or a succulent lunch/dinner, chill out at the pool, or just stroll by Scenic Highway 98 to see Destin's treasures like a real local. If you want to take a break from the beach, Summerhouse is just five minutes from Destin Commons shopping center and minutes from Silver Shells premium outlets, various amusement and water parks, and numerous restaurants. There are many other things for the kids to do, as well. Within 4 miles is the Big Kahuna Water Park, a skating rink, the racetrack, and bungee jumping for the daredevils. Kids will also love to play and run safely on the huge fenced backyard that the complex offers.